Robert Drapkin, M.D., is a health care provider who is board-certified in Internal Medicine, Medical Oncology and Palliative Care. He is in active practice, working to save lives and improve quality of life through the education of his patients. He provides up-to-date knowledge and guides his patients through their illnesses, exercises and diets. He has been in active practice as a doctor for over 36 years. 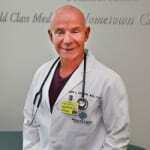 Dr. Drapkin is currently 70 years old, and started training as a bodybuilder when he was in his fifties. He has been a competitive body builder for 17 years, and has won many titles and contests. He recently trained for a national event in July, 2015. For more information, visit http://drrobertmdfacp.com.